Big thanks to hourences for his great textures hourindus and hourpitores. Special thanks also to KaMi for betatesting. An urban-themed map utlitizing the brand-spanking new and excellent Hourences HourPitores_UT texture package. Unlike previous inner-city/modurban UT maps we've seen in the past, this setting harkens back to the '20's/'30's with its propaganda-themed posters (shades of Redkin perhaps?) and sandy-colored stone and brickwork blended with the occasional wood. Making an urban-themed map beautiful and fresh is something that's fairly difficult to do as its what many of us are exposed to on a daily basis. 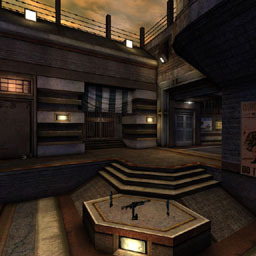 However, switching the present for a particularly nostalgic era in the past, and with careful texturing, lighting, and architecture work, it can be done, which this map proves. The texturing here is fairly varied while remaining nicely consistent throughout the map. The floors are a nice, though sometimes haphazard mixture between cut stone paving, wood, metal, and asphalt. The walls bring home a more dated city feel consisting mostly of brick sometimes lined with cement. The walls and overhanging architecture are supported by metal beams which help delineate the forms and hold the pieces together. The posters are slapped on the walls throughout the map and help provide a sense of location as well as accentuating the time period. One problem I had was that there are a few areas using water and which are textured with floating lilypads. Although very nice looking, they seem a little inconsistent with the overall theme. I would expect the water in a city of this period to be somewhat dingy and murkey with lilypads and associated water plants confined to public fountains and private gardens. The lighting is quite nice with some fairly good hotspot/shadow contrast work. 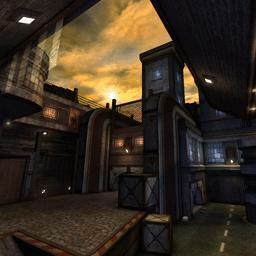 I think some areas could have used a bit higher radius hotspot work because the blue light that's used through the map combined with the light coming from the sky tends to blend together a little too well creating an impression of a little bit of ambient light rather than source-specific light. However, this impression is kept to a minimum. Some of the windows also seem to be a little inconsistent in terms of style and therefore the light color they produce but, again, this is few and far between. 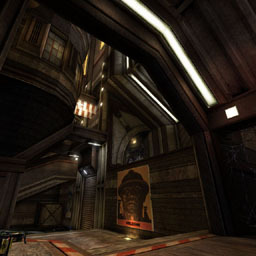 The architecture is a lovely blend arrivng at a spot somewhere between Hourence's Redkin, HL2's City17 (this might be a stretch for some of you) and Kami's recently released CTF-Gataka. I couldn't help but be reminded of all three of these when playing this one. But it achieves its own feel as well through the use of the curved architecture and the texture and color application. The three combine to accentuate the architecture nicely and the drama created by the taller buildings is a nice touch. One other bother for me is that it seemed like there were a few architectural pieces that functioned only to divide a play area and didn't fill any purpose or implied purpose toward the theme. In general, quite a lovely map with a bit of a fresh take on the traditional urban map. There were a few texture and lighting inconsistencies IMO, but overall it's quite a nice looking place to spend some UT time in. The BSP is nicely constructed and flows together well. The lifts and pathing a quite good as well. The zoning is adequate although there are some quite large zones here. I understand this is due to the open sky through much of the map, however I get the impression it could have been broken up a little more. Still framerates hold up fairly nicely in spite of this. The sound is a differnet matter. There are locational ambient sounds and they are mostly fitting their environments. However, they're spaced fairly far apart and there are no general ambient sounds filling in the space. Also lacking are triggered or item/place specific triggered sounds. There were two water splash triggers but I think more could have been used through the map. In general an very good built where the only aspect lacking is a more detailed soundscape. The gameplay here is quite good. Concentrating mostly on varied z-axis rather than storied z-axis, the map flows well between all the levels. Due to the lack of storied z-axis, you'll find yourself fighting mostly up or down slope rather than fighting someone above or below you. In general I would have liked to have seen more of a balance between the two types of z rather than it being so heavily concentrated on slopes. The bots get around very well and although you'll learn to predict areas where they tend to concetrate I believe this is due more to the player count than either bad pathing or weapon placement. I found the weapon placement to be quite good and was never found wanting. The damage amp is placed in a relatively unique place and yes, the bots do grab it from time to time. In general the gameplay is quite nice with the only lacking aspect being a lack of storied z-axis compared to the amount of variable z-axis. Put together this is quite a good DM map. Lovely visuals, quality construction, and pretty decent gameplay all co-exist peacefully here in this urban theme. A bot more storied z-axis and some better architectural functionality and soundscaping would have completed this map. A must have for DM players, this is one the non-DM players should consider getting as well. I like this map. 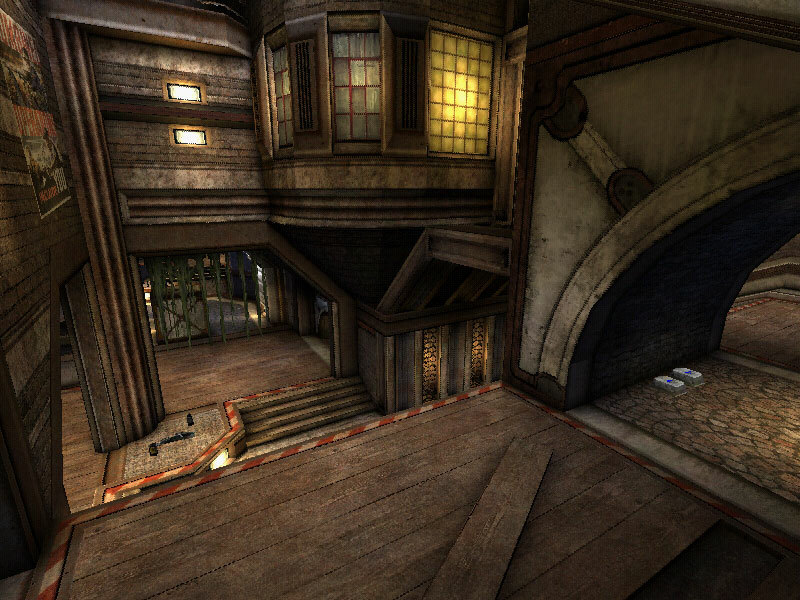 It's a nice arena with good texturing, lighting, flow, bot support, you name it. It's good to see the author uploaded it to Nalicity, i downloaded it off Unreal Playground. In any case, i recommend you give her a try. holy crap that is just.... frigging awesome. i love it. w00t! can't wait to see the UT2004 version!! Visually good map, like its appearance. I also found the gameplay of the map forced a bit too much into the area with the body armor (which the bots didn't grab :/) and the rl. Bots didn't grab the Damage Amp as well, maybe because of Transloc set to OFF, but I got it with impact hammer, so the bots should be able to get it as well. EDIT: KK I only played two matches and they didn't grab any. Will play further and then change things here. 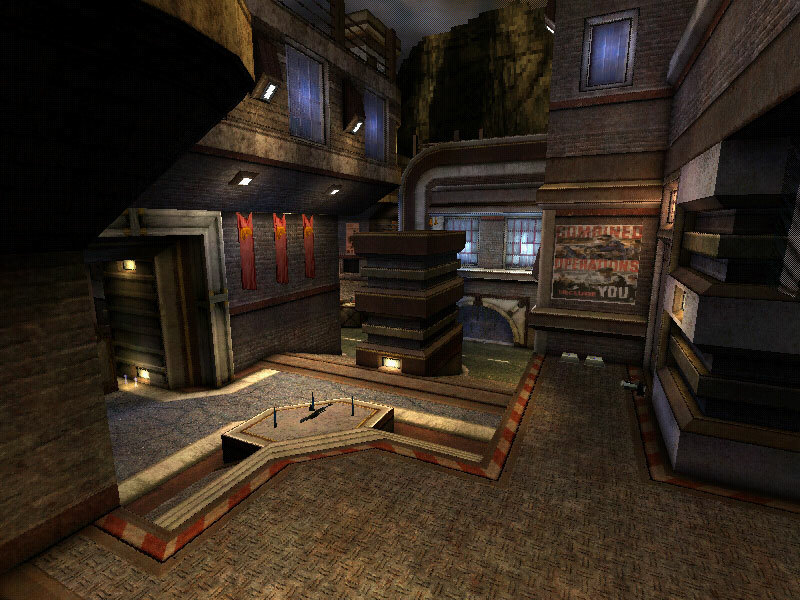 I�m looking forward to the UT2k4 version, by the way. 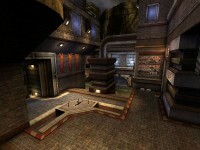 wow, just glancing over the screenshots, i thought it Was a 2k4 map. can't wait to see the Real 2k4 version. Oh yeah this one deserves some serious recognition. Fianlly a map with enough axis and enough room to move around in. 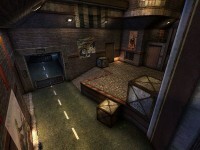 sweet map! great looks and gameplay - another great demo of the excellent hourences textures! Sorry, too tired to write full sentences. Just got back home and I am dead tired.